For a long time, BMW and their cars stood proudly behind the famous slogan, “The Ultimate Driving Machine.” BMW was known to be the discriminating driver’s choice in the luxury car segment, and the brand from Bavaria was a company that produced automobiles known for their balanced handling, precise steering and, may we add, perfectly-tuned engines. That was then: over the last few years, BMW has significantly expanded its lineup to include everything from five different models of SUV in all shape and sizes, as well as two portly hatchbacky-type things they call ‘Gran Turismos.’ Let’s not forget plenty of inexpensive, entry level cars and crossovers with turbochargers and numb electric steering setups. Without a doubt, BMW is shifting from its niche as the driver’s choice to appeal to a much broader audience, which, from a business case, makes a lot of sense. It’s something for everybody! To those that believe the company has gone off the deep-end in search of volume, BMW has one thing to say: M2! The 2016 BMW M2 was built to be a car for driving enthusiasts only, and it follows the same formula as its predecessor, the 1-series M. Shoehorn M3 parts and a crazy engine into a smaller body, take out a lot of weight and boom, Bob’s your uncle. The new M2 gets the M3/M4’s suspension, forged 19-inch wheels on Michelin Pilot Super Sport tires and enormous brakes as standard equipment. Thankfully, the M2 does not get the M3/M4’s twin-turbo S55 straight-six, which sounds like a Hoover vacuum with a baby pacifier stuck in the nozzle. Instead, the M2 is powered by a version of the single-turbo N55 straight-six found in the M235i but upgraded with pistons from the M3/M4’s S55 motor. 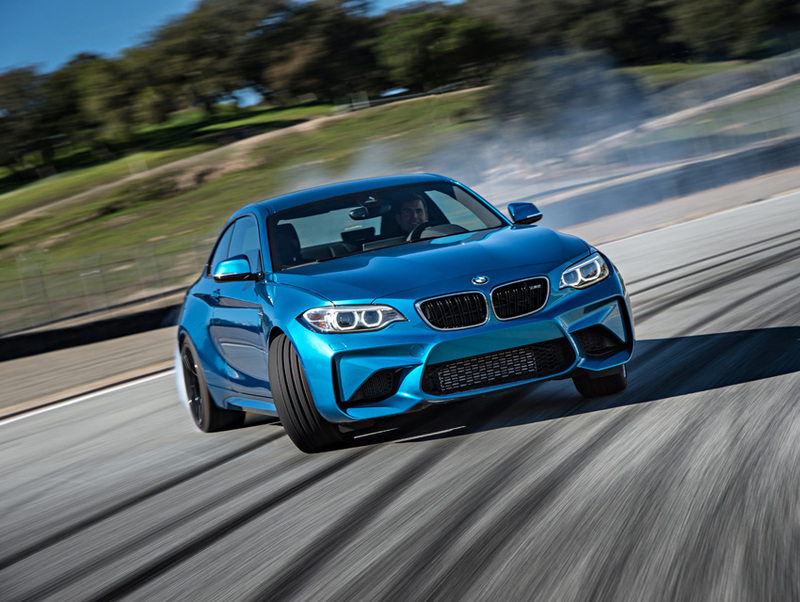 The M2 sounds deliciously throaty and refined with a potent engine that produces 365hp at 6,500 rpm, and 343 lb-ft of torque as low as 1,400 rpm with an overboost function that briefly raises torque to 369 lb-ft. While a 7-speed DCT automatic is optional, the new M2 is ideally paired to BMW’s slick 6-speed manual, which is what I had a chance to drive recently at the famed Laguna Seca track in Northern California. The typically scrawny 2-series has finally found the perfect proportions in the wide-bodied M2, with extended fender flares (50 mm up front and 80 mm for the rear) and the remarkably aggressive front and rear bumpers alone have turned the 2-series into a squat, angry ferret of a car and one of the best-looking cars that BMW has built in years. Wider is better and BMW has executed this beautifully with the M2. The interior gets the special treatment, with blue stitching, some nice alcantara accents and, of course, a plethora of M badging to set the car apart. So how does it go? The short answer is, really really quickly. 0-60 comes in 4.2 seconds, and the quarter mile blows by in 12.8 seconds, but the true beauty of the M2 lies in how entertaining it is to drive. The chassis is beautifully balanced, with a planted rear end that can progressively and gently break loose on demand with a bit of throttle input, something that the twin-turbo M4 has trouble doing once its power comes on. Although the M2 rides stiffly, it isn’t so punishing that the car can’t be enjoyed every day, because it certainly can and, importantly, for the first time since implementing electric steering, BMW has finally found a way to transmit a level of road feel back to the driver, giving us hope that BMW hadn’t completely lost its soul to numb steering feel. Up and down the hills and turns of Laguna, the M2 was planted, fast and a whole lot of fun to drive at that speed, especially with the manual transmission. That said, coming hot out of turn 4—a sharp and technical right-hander—I, for once, played myself, braking late with a little too much speed. As the rear-end lost grip and I began, for just a moment to fear. Which was all for naught, as the M2’s ‘M Dynamic Mode’—a sub-function of Dynamic Stability Control—offset my foolish driving and loss of traction by taking several measures—reducing engine power, braking individual wheels—and lo, the car was stabilized and all was fine. Note to self: The Gentleman Journalist is not as fast as he once was. Overall, the new M2 is exciting to drive in any situation. Everything that makes the M2 shine on the track, from its incredible balance, progressive handling characteristics, and responsive engine, is still accessible and enjoyable on the road as well, just a whole lot louder than what you’d expect from BMW nowadays. We also had a chance to spend some time in the new and quite expensive BMW X4 M40i—their new sports crossover—and while the X4 features a detuned version of the engine found in the M2 and M badges all around is really a sports crossover in search of a market. That market not being me. While it was enjoyable to drive, the limited space in the back seats, with its complicated ingress and egress and close to 70K price tag when loaded, the X4 M40i is as niche a model as the M2. The BMW M2 starts at $51,700, a relative bargain considering that it matches the performance of the M4 while being much more enjoyable to drive. We think the best way to order an M2 would be to take advantage of BMW’s highly rated European Delivery service. After completing your configured M2, fly out to Munich to tour the BMW factory, pick up your M2, and explore Europe, while BMW takes care of insurance and delivery and even lops $2,600 off the MSRP. Father’s Day is coming up, in case anyone needs a hint on what to get me. Jon Alain Guzik is the luxury car columnist for Los Angeles magazine. He is the founder of PrazoCars.com and dreams of owning an early-90s BMW 8-Series one day.